With revision season nearly upon us, starting the revision process can be daunting for students. To ease the pressure, we have pulled together a selection of popular and recent resources to encourage student-led revision in the classroom and at home. Visit our GCSE science revision collection for more revision resources. 4 revision sheets with questions covering Crude oil, alkenes, alcohols, carboxylic acids & esters from the 9-1 GCSE specification. The sheet is designed to be worked through independently by students allowing teacher to provide support during the revision lesson to the students in most need. This revision activity will take most of the lesson to complete. The later slides in the slide pack are the mark schemes. These can either be printed out for the students to self-assess or projected by the teacher. Perfect for revision for after all of the content has been taught or as a revision lesson after each topic. Each revision sheet is heavily based on the specification and sample assessment material so only relevant content to the exam is contained to give the best resource possible. Higher specification points are clearly outlined with a [H] so these sheets can be used for your higher and foundation pupils. This resource has sold hundreds of times but I have no reviews! If it works for you leave a review so others can benefit from it!! 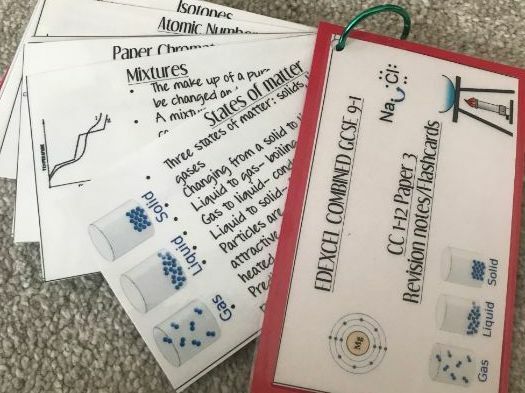 Revision flash cards made for my SEN students to revise for Paper 3 Chemistry. Includes notes on the front and 3-4 questions on the back of the cards. I printed, laminated them and put them onto a binder ring to reuse them. For ease of downloading this also comes in a whole GCSE bundle, and as part of a ready made revision pack. This resource is a small part of a large set including a range of self-assessment of specification statements, revision questions and homework sheets. Visual booklet which introduces the ideas about Punnett squares by starting with some revision on chromosomes and genes (including DNA). 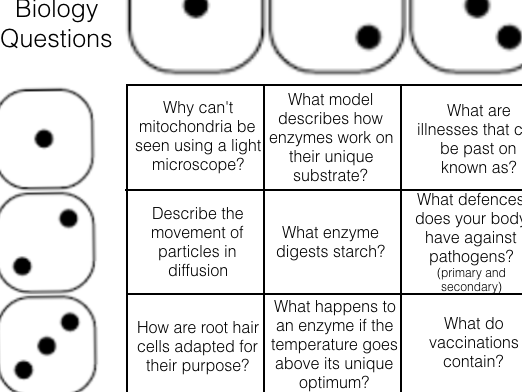 The booklet introduces Punnet squares slowly, building on knowledge gained throughout the lesson to allow students to build up to high level questions and answers. Exam style questions included around Punnett Squares and homo and hetrozygous genotypes. Pupils find these handy as a quick reference/revision tool to aid their memory recall of key factual concepts of CB4. For unit 1 of AQA’s Triology scheme of work (2018 exam). This makes a concise revision sheet for the important aspects of cell organelles, different types of cells, stem cells, mitosis, diffusion, active transport and osmosis. 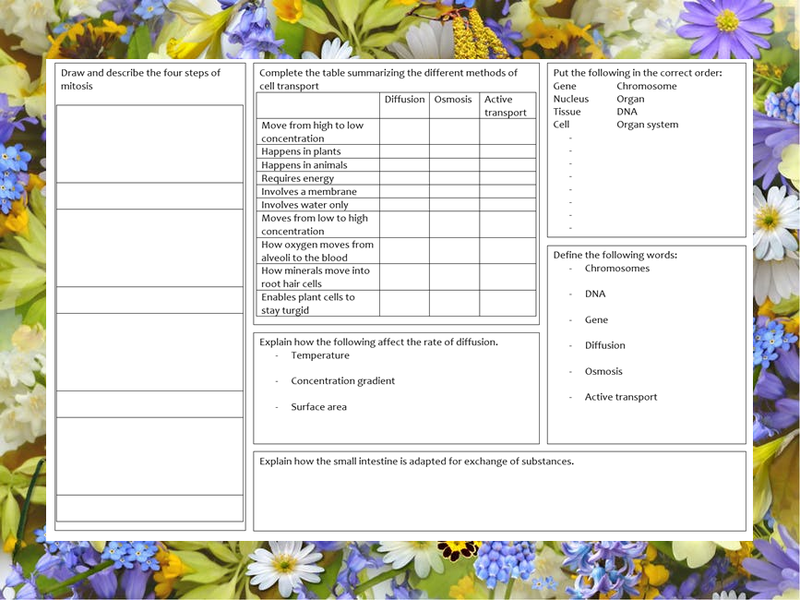 The revision mat is two pages of A4 that can be printed back to pack and comes with an additional revision mat with the answers completed. I have created a booklet to help y11 revise in preparation for AQA paper 1 physics trilogy. This booklet is aimed at higher tier students. The first sections help the students to become recap units, equations and prefixes. The mind map allows students to be familiar with the content then complete questions on each topic. 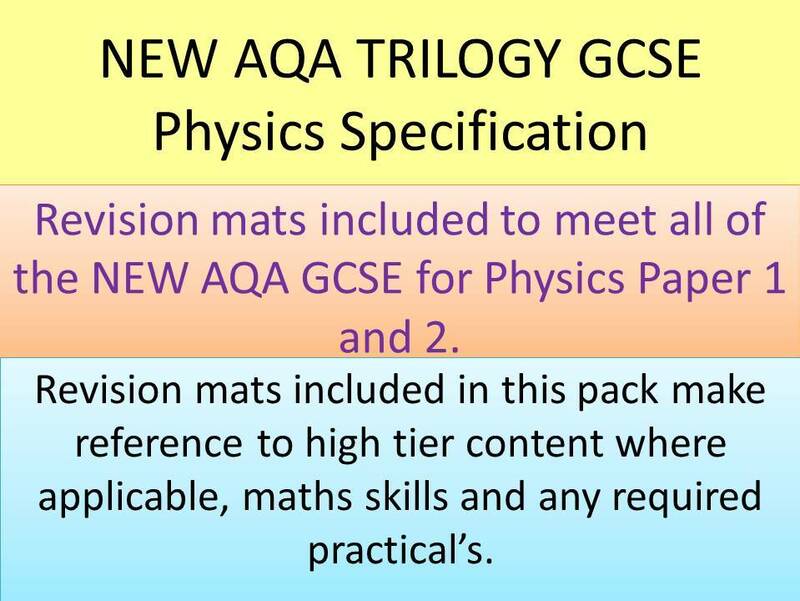 Revision mats for Paper 1 and 2 Physics exam for AQA Trilogy. The revision mats cover all higher tier contented as highlighted by HIGHER TIER in bold next to the relevant text box. Maths skills and required practicals are also included where possible. Place mats are broken down into topic areas within the whole unit so you can chose which area to focus on. This is a complete set of Physics revision checklists for handing out to students. They follow the AQA specification, but have been reworded, reordered and streamlined in places to make them more student-friendly than the specification document. Equations and required practicals are highlighted. My Year 11s needed a one page Big Picture. They seemed calmer when they got this! I created a game to help students revise in an engaging way. 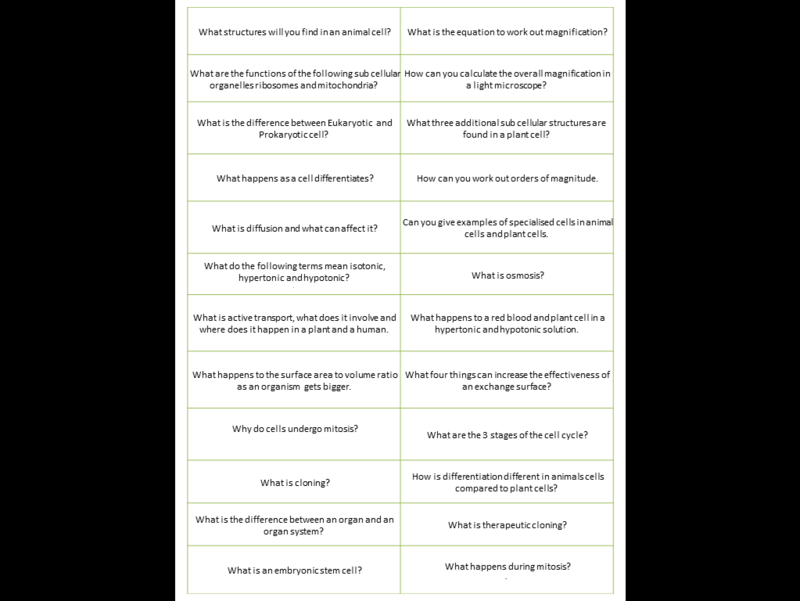 Majority of columns are designed to have a different topics, so it will become clear to students and teachers where strengths and weaknesses lie. revision flash cards for all of the first 2 units of each Biology, Chemistry and Physics courses. It also includes keywords for each unit.